“After you” said the man, gesturing for the lady to go ahead. 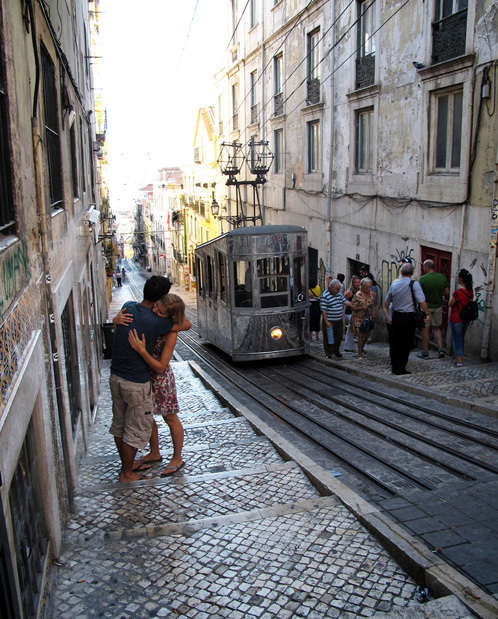 They squeezed past yet another group of tourists, and calmly waited for the tram to reach the top of the hill. Ever the gentleman he held the door open and took her hand, as she stepped up into the carriage. “Thank you” she giggled, as he followed her onto the tram. She caught the eye of one of the young couple across the street, and they exchanged smiles just as the tram began its gentle journey back down the hill. He couldn’t believe this was happening, here she was, the girl he had the biggest crush on in school, sitting beside him. He stared out the window and couldn’t help but smile. They laughed and joked for the whole journey back into town, exchanging stories about their lives, and reminiscing about the good old days. “Señor, last stop” said the conductor impatiently. Throngs of tourists were already boarding the tram. They made their apologies and stepped off, both of them collapsing into laughter as soon as they had alighted. She took his hand in hers and gave him “that” look, and they shuffled on down the cobbled street towards the market, his arm around her. The air was filled with intoxicating aromas, spices from all corners of the globe, local delicacies steaming away on hot pans. They made their way through the labyrinth of stalls, fresh smells greeting them at every turn. They paused occasionally to try something or just to take a break. He helped her sit down on a nearby bench and returned to the stall they had passed a few moments earlier. He bought a single rose and returned back to where she was sitting, hiding it behind his back, even though he knew she had been watching him. He took it out from behind him and held it out. Her eyes lit up, and they embraced and sat hand in hand, and observed the street around them. Families with screaming kids, young couples in love, old men with walking sticks, people of all ages and nationalities floated by as they sat and watched the world go by. They were in Portugal for their 50th wedding anniversary, staying in the same town as they did on their honeymoon. Not much had changed over the years, and that’s what they loved about it. The narrow cobbled streets of the old town, were an oasis in the middle of a crowded bustling city that had grown up around it. When they first came here it was just the old town, the streets were empty except for the odd local walking home, loaf of bread in hand. Now it was thronged with tourists, and the old bakery they used to get their bread from was now a tourist shop, selling the same things as the shop beside it, and the shop beside that one. Still, this where they called home now, having emigrated when they retired. They returned back the familiar route to their home, down by the now disused water well, and past the house with the barking dog, through a narrow entrance way that he had cut his head on the night of their honeymoon. He still had the scar. They arrived at the former Hotel Fausto, now an apartment complex they called home. Their apartment was the former honeymoon suite they had stayed in all those years ago. She made her way to the kitchen and put the rose into a vase with water, and joined him in the living room. He helped her into her chair and turned on the television. At around six the doorbell rang and he got up out of his chair and shuffled over to the door. He opened it and a smiled broadly, it was the couple from earlier, their daughter and her husband. They were coming around for dinner and had brought a nice bottle of wine and some chocolates. He happened to be working in the city and she had come over for a holiday. They spent the evening chatting, laughing and enjoying the wine. After dinner they tore into the chocolates and watched an old movie they had seen a dozen times, but it was the mother’s favourite so they didn’t complain. After it finished they said their goodbyes and the young couple went back to his apartment in the city. The couple stayed up and talked into the night before dozing off in the early hours of the morning. He awoke to the sound of that damn dog barking at the postman as he made his rounds. It was another glorious day, the suns rays peeking in through the window shutters. He got out of bed and began his morning ritual of opening all the shutters, yelling at the dog, and going downstairs to fetch the paper. He would then go into the kitchen and boil the kettle for tea and then cut up bread and butter it. He then put the bread and a cup of tea on a tray and brought it up to his wife. “Good morning darling” he would say and they’d sit together on the end of the bed and have their breakfast together. He picked up the tray and made his way upstairs, the last step creeking as it always did, waking her up and letting her know breakfast was ready. He laid the tray down on the end of the bed and went to kiss his wife good morning. When he got round to her bedside to kiss her, he collapsed onto the floor and stared at her, a tear ran down his cheek. She had passed away in the night, succumbing to the illness that had made plagued her for the past few months. Another tear ran down his cheek, and then another. He kissed her on the forehead and put her hand in his, and bowing his head, he wept for the love of his life. Flying V! Do the flying VEEEEEEE!!! !